When SSL Endorsement is scored or stolen, place 9credit from the bank on it. When the Corp's turn begins, he or she may take 3credit from SSL Endorsement. This ability is active even while SSL Endorsement is in the Runner's score area. 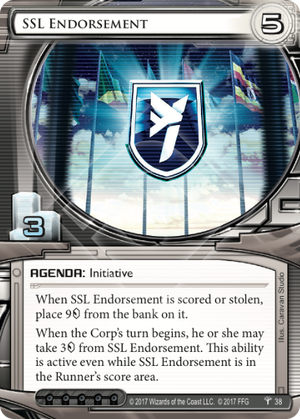 SSL Endorsement joins the short list of agendas which offer an ability (passive or active) to the corp while they're in the runner's score area (15 Minutes, Global Food Initiative, Medical Breakthrough, and yes, even Merger). However, this new 5/3 might be compared most to Corporate Sales Team for its similar drip economy (CST's 2 per round for 5 rounds vs. SSL's 3 per round for 3 rounds). Yet, I would beg to differ that SSL Endorsement is even better given it doesn't have GFI's pip of influence or CST's lack of working in the runner's score area. In addition, the agenda lets you choose which turn you want to take the credits on which can help you recover if you're expecting to get Sipho- I mean get your funds diverted. Overall, this is a good, if not great, 5/3 neutral agenda. Time will tell if it joins Global Food Initiative at the top in popularity. Do note that this is just another card Film Critic laughs in the face of since it will place 0 on SSL Endorsement when it moves to the runner's score area.